This report was always going to be the start of a long process which will eventually lead us to the truth about why 96 football fans died on 15th April 1989. One of the biggest question marks from the original investigations related to the coroner’s inquest which found that none of the victims had survived after 3.15 pm. This finding had a huge influence on all that followed. It was a finding that was always disputed by the families and by many independent observers. It was a finding that was finally discredited by publication of the report. I can still remember my jaw dropping as I heard the panel’s medical adviser say that 58 fans could well have survived after 3.15. This undermined the inquest findings and all other decisions that flowed from it. Today in London the High Court, following an application by the Attorney General, has quashed the original inquests. Fresh hearings will now follow. The Lord Chief Justice specifically referred to - "deliberate misinformation surrounding the disaster". This has been one of the worst and most damaging cover ups that I can recall; damaging to the emergency services, damaging to our justice system and damaging to the families who have had to fight for over 23 years for the truth. Those families have often been criticized in the media and have fought against all the odds. The judge paid a particular tribute to their fight saying he wished to record - "our admiration and respect for their determined search for the truth about the disaster and why and how it had occurred, which - despite disappointments and setbacks - has continued for nearly quarter of a century." The truth has been a long time coming. And there is still much to do. But hopefully we have now moved a significant step nearer. There is trouble brewing between our most Senior Judges and the government. On the face of it the decision over who can appoint the Chief Executive of the Supreme Court is not that exciting. But it raises an extremely important issue over our constitution. Traditionally the right to make this appointment has been with the Lord Chancellor who is also the Minister of Justice. In days gone by, the Lord Chancellor had a judicial role. It is now very much a political role; the current incumbent is Chris Grayling who is not even a lawyer. The Supreme Court is the final court of appeal in this country. Its judges are our most senior and its decisions are, by their nature, of great social importance. The Supreme Court judges argue that the appointment of the Chief Executive should be in their hands and not those of a politician. It is a role which controls the finding of the court and should therefore be independent of any political influence or control. I remember the former Home Secretary David Blunkett once saying that he 'begged to differ' with the views of the courts. That is fine. Politicians can differ as much as they like. But the problems begin when they can excercise control over the judiciary. An independent judicial system has always been at the heart of our democracy. That is why this apparently dull argument over who has the power to give someone a job is so important and could ultimately affect all of us. Twitter trial on the cards? We seem to be heading for a high profile court action over a tweet. This concerns the action taken by Lord McAlpine over a tweet from Sally Bercow which, he alleges, associated him with claims of sexual abuse. She is a well known user of twitter with over 56,000 followers and is married to John Bercow, the speaker of the House of Commons. She denies that her tweet - "Why is Lord McAlpine trending? *innocent face*" amounts to defamation. Neither side is showing any sign of backing down so we could see a full blown trial some time next year. I have said before that a comment made via a social media site can be as damaging as anything published in the press or on TV. If 56,000 people retweet to just a 100 followers each, then we are talking big numbers. Whether Sally Bercow’s words are in fact defamatory is for a court to decide and I would not presume to predict what the outcome will be. But what is clear is that the litigation was avoidable. She did not have to post the comment. This is a clear danger of social networking. We have all become social commentators. That can only be a good thing for democracy and anything which widens free speech must be encouraged. But if we are going to become the new media we must be subject to the same legal rules. And if we defame someone then we can be sued or prosecuted. Is it really worth the 140 characters to find ourselves dragged into court; whether rightly or wrongly? Maybe sites like twitter need to have a safety net system so before you tweet it asks you if you seriously considered the possible consequences! Claims for whiplash injuries following Road Traffic Accidents have been controversial for a couple of years. Whilst the insurance industry has attacked personal injury claims in general they have pulled out all of the stops as far as whiplash cases go. So we have a proposal to dramatically change the system for pursuing motor claims generally. Those changes will make it hugely more difficult for the 93% i.e. the overwhelming majority, to pursue their cases. Fraudulent claims are a problem and they should be eliminated but this seems to attack all claimants; which is clearly disproportionate. It seems to be part of a deliberate plan to make all victims feel that they are the ones at fault and are fraudsters just because they have been injured through no fault of their own. The consultation itself has two main proposals. The first is to increase the small claims limit for whiplash or, more likely, all RTA claims to £5,000. The effect of this is that no legal costs will be recoverable. So there will either be a big increase in litigants acting without legal advice, or people will be deterred from claiming. For most people £5000 is a lot of money and cases of that value can require expensive medical evidence. Although the ministry talks of preserving access to justice, the proposals will have the opposite effect. The second, more controversial, suggestion is that there will be a panel of medical experts and only they will be permitted to prepare reports in whiplash cases. This is extremely dangerous and will inevitably lead to satellite litigation. Who will be eligible to be on the panel? Will an expert be removed if he is not sufficiently hostile to whiplash claims? Why should the evidence of one independent medical expert be safer than another? We already have a robust system for vetting medical evidence. If insurers are concerned they obtain their own evidence. The claimant’s expert can be questioned about his/her opinion. In fact one of the biggest problems with the current system is that insurers try to settle claims directly with victims before they get to lawyers, and do so without any medical evidence at all! The government needs to ask itself whether these proposals will protect the public and maintain justice or simply enable wealthy insurance companies to make bigger profits.We are told that these claims are the cause of high motor premiums. I have yet to meet a single person who expects that insurers will give them a rebate from any savings..
A Year in the Life of El Presidente!! My year as President of Liverpool Law Society has ended today! It is the season for Reviews of the Year. So here is the speech I gave to the AGM. 'Can I start by saying how proud I am, to have been president for the past year? 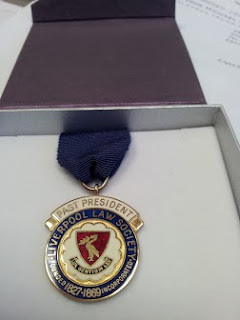 My Association with Liverpool Law Society goes back to 1980 when I first qualified. I worked at the Vauxhall Law Centre for three years and was employed by Liverpool Law Society. That fact alone must give a unique place in the society’s history. It also demonstrates the Society’s long commitment to Access to Justice for ordinary people. This has been a very busy year but also one of transition. We have seen the seeds planted for major changes across the profession most of which will have their full impact during my successor’s year. So good luck with that one Vice President. But firstly let me report on what I have been up to. I have done 18 formal dinners. You don’t want to think about how many Crème Brûlées that is. I have been to Belfast, Dublin, London and Leeds. In the latter case I have to report that I temporality lost the jewel which was not a pleasant experience in a multi storey car park at midnight. Thankfully it was in the lining of my jacket. I have done about seven valedictions - speeches in court to retiring judges - which have been a great experience. The most memorable was the one for HHJ Adrian Lyon which was presided over by Leveson LJ. I was quite proud to tweet that I had just appeared before Leveson. I have chaired numerous meetings including our HR, IT and Training Forums which have been excellent opportunity for those involved in these important support roles to network and discuss issues of common concern. I have also chaired two meetings with local MPs and two with our local councillors. These meeting were bound to be dominated by the Legal Aid, Sentencing and Punishment of Offenders Act – affectionately known as LASPO. All of those that we met were sympathetic to the case we made against removal of legal aid and it was a disappointment that most of the bill got through without amendment despite its mauling in the House of Lords. But we have built up strong relationships with those elected representatives which can only serve us well in the future. It was encouraging that we had MPs from the two major parties last time we met and it almost the fulfilment of a life’s ambition when I had to call them to order in the style of the speaker. The Local Law Societies’ Conference was hosted by Nottingham Law Society and I attended along with the Treasurer and Sarah Poblete. In May we hosted the tripartite event with our friends from Dublin and Belfast. They particularly enjoyed the treasure hunt around iconic Liverpool Hostelries – pub crawl! This annual meeting with our Irish friends has grown over the years and we hope to see it develop into more of a networking opportunity over the next few years. We also had our Summer Ball at the Liverpool Hilton hotel which had a 60s theme and was compered by the Society’s own aging hippies Charlie Jones and yours truly. We have had two very successful wine tasting events in the winter and the spring. On both occasions the sign of a successful night was the President flicking the lights on and off at 10.30 to call last orders. We have continued to maintain and develop our excellent relationship with the Judiciary. We had our annual Judges Question Time with their Honours De Haas, Goldstone, Gore and Hodge. This has become an important feature of our programme and I am very grateful to our local judges for their support. On a similar note we also hosted the Conkerton Memorial Lecture given by Baroness Hale of Richmond on the independence of the judiciary. This was a fascinating talk which was followed by the Opening of the New Legal Year and then dinner with Lady Hale and the Senior Judges at the Raquets Club. We have two international moments this year. Firstly I hosted a visit from 22 Lawyers from the Peoples Republic of China none of whom spoke any English so networking was not easy. They were fascinated by the photos of the Past Presidents especially the older ones with the most impressive facial hair. We also welcomed two lawyers from Rwanda who were here on placement at our two Universities. I was surprised at how young they were. They explained that the reason for this was that the profession was largely wiped out in the genocide and so they were starting from scratch. A sobering thought. I have been keen to strengthen our links with Chancery Lane. The relationship between the National and Local Law Societies has not always been healthy. But this has certainly changed over the last few years. We each have important and different roles to play. Chancery Lane is able to deal with national and even international issues. We have the local expertise and experience and can best serve our members when we work together. In July, I attended a private dinner in Birmingham with the current President Lucy Scott Moncrieff. She is keen to work with local law societies and understands the issues that we face. We did have an opportunity to work together in September this year when the MOJ announced proposals to impose Sunday Court Sittings on our Criminal Law Practitioners. Our Committee Chair John Ballam organised an effective campaign of opposition which saw a unanimous statement from local firms that they would not sign up for the voluntary duty solicitor scheme on which the initiative depended. Nick Fluck who is the Vice President of the Law Society came up for a meeting at Weightmans where he confirmed the Society’s support. In all this was an effective campaign which led to our getting a mention in the Law Society’s as mutinous Liverpool lawyers which I have to say was one of my proudest moments of the year! We also took part in the first legal sponsored walk at the beginning of October. This was to raise funds for the North West Legal Support Trust which promotes Pro Bono initiatives. The work of the trust is likely to increase dramatically in the wake of the impending legal aid cuts. We walked alongside colleagues from the bar, the Judiciary and CILEX and I hope that this is the first of what will be an annual event. This resulted in our second mention in the Gazette in as many weeks! 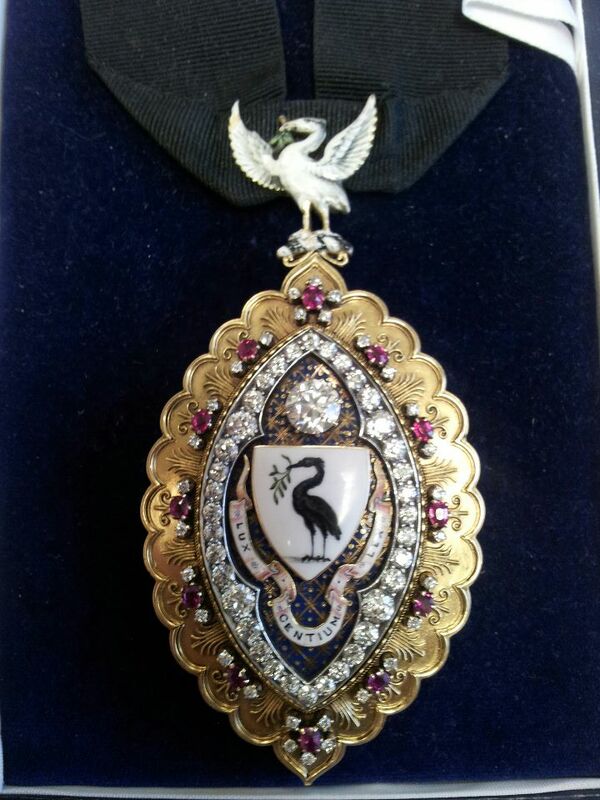 In November we had our 185th Annual Dinner at the Adelphi Hotel. The attendance was about 220. There has been a gradual decline over recent years which is to be expected in a challenging economic climate. Other organizations have seen a similar picture. But the dinner was a success none the less. Our guest speakers were Nick Fluck and Rick Pratt QC, Leader of the Northern Circuit. I was particularly grateful to Rick who stepped in at the last moment to give one of the most memorable speeches of recent years. Despite the reduced numbers we are committed to continuing with the event and certainly hope to reach Dinner number 200 but I will be well gone by then. Alongside these events we have continued with our CPD Programme of Seminars and conferences. This has been a very difficult year as seen by the accounts. The provision of CPD training has been a major source of income over the last few years and we have benefitted from this. But there has certainly been a decline in the demand particularly during the recession. We have also seen more firms providing training in-house and the growth of webinars. We had tried to introduce webinars with a view to modernising our programme but there was a very poor take up from members for an expensive product. This has been the most significant cause of the losses that have been made in the last year and we have now decided to suspend the programme. This is regrettable but it was something that we had to try in order to offer our members a wide range of options. I do wish to pass on a particular thank you to Past President, Donal Bannon whom I persuaded to take on the extremely challenging role of chairing our Training Committee for the last year. I’m not sure if he will thank me in return! So while I am on the subject I also wish to thank my Vice President Alistair Fletcher for his wonderful support over the last year. Thanks also to out treasurer Glenys Hunt who has looked after accounts through two of the most difficult years in our recent history, and also the Joint Honorary Secretaries Cathy Fielding and Nina Ferris. Congratulations also go to Nina for having the unique distinction of giving birth to Antonia Thymaris Dawson whilst serving as an officer of the society. Presumably that also makes her the first to be congratulated in the president’s annual report!! And so another year draws to an end. I cannot believe the speed at which it has passed. Thanks to you all for allowing me to serve as your President for the last year. And good luck to Alistair Fletcher for 2013. Fighting for justice - the end of a career choice? I have often been asked what made me decide to be a lawyer. To be honest I would have to say that it seemed a secure career that would be intellectually challenging and provide a reasonable living. But I know that I am not alone in saying that there was something more than just that. I genuinely wanted to fight for justice for ordinary people who were having to battle against powerful government bodies or wealthy Companies including insurers. I could point to many solicitors and barristers who would say the same. Justice for all has been seen as a foundation stone for any civilised society. The great civil rights campaigner Martin Luther King said – ‘The moral arm of the universe bends at the elbow of justice.’ This has drawn many into the profession for centuries. Never before has the opportunity to do it been under greater threat. Another consequence of this will be to deter a whole generation of students from choosing the law as a career. If they want to fight for the rights of the weak and vulnerable then it seems that this particular option is not for them. And it is not only legal aid. We have seen recent devastating announcements about cuts to the fees which lawyers can recover for pursuing damages claims for ordinary people – in many cases as much as 60%. Lawyers will not get a lot of sympathy for this. But it will have wider effects. The ability to recover fees from wealthy insurers and companies has been the gateway to justice for many who do not have the massive resources available to them. If lawyers are simply unable to work at those rates, and stay in business, then that gateway is closed. I already know of firms who are planning closure leading to inevitable job losses – not only of lawyers but of hundreds of support workers. So again if anyone is attracted to the law to fight for the weak then again it would seem that the door is being slammed in their faces. Are we going to be left with a profession which represents the wealthy commercial sector but is barred from representing the less well off? That is a real and serious danger. I suspect that the real fight will only begin once the cuts begin to bite. I suppose it was inevitable that Lord Justice Leveson’s report on the media would dominate the media for the last week. Most of the comment from press has been defensive and has opposed some parts of the report. There cannot be any doubt that more robust regulation is needed. The Leveson Report recommends a new Press Regulator which is truly independent. In particular it must be independent of editors, owners or politicians. I doubt if anybody could dispute that. What is a bit more controversial is his suggestion about what happens if say a newspaper refused to sign up. Leveson suggests that there should be a safety net in the form of a statutory body like Ofcom. This would give the new regulator some statutory power. This suggestion of a legal ‘stick’ has some commentators up in arms. The Prime minister has talked about his serious misgivings about State Regulation. Not surprisingly, many of the most powerful media players are saying the same. But I think that Leveson has it right. Over the last few months we have seen horror story after horror story of press excesses – the lowest point being the hacking of Mille Dowler’s phone. Nobody can doubt that something far reaching is necessary. There is no public support for the status quo. But will the statutory powers undermine our treasured freedom of speech. I don’t think so. Hopefully the responsible papers will agree to a tighter self regulation. Those who do not deserve all they get. We should do all that we can to protect free speech. But there has to be a difference between that treasured right and the power of the press to walk all over people. The sooner Leveson is brought into law the better.